Save an enormous amount of money by remodeling old kitchen cabinets either when you completely redo the kitchen or as a single project to modernize and decorate. There are a number of ways to change the look of old kitchen cabinets. Replace hardware for a more streamlined look; paint the front facing of the cabinets to freshen up the room, or remove the doors on the old cabinets and replace them with new cupboard doors. Consider the time you want to put into the project, your budget and your skill level when looking at remodeling options. Get quotes from outside contractors to do the work for you before setting aside your time allotment for the job. It may costs less in the long run to hire a professional. If you enjoy home remodeling, build extra time into your estimate for preparation work, shopping and unforeseen obstacles. Save an enormous amount of money by remodeling old kitchen cabinets either when you completely redo the kitchen or as a single project to modernize and decorate. There are a number of ways to change the look of old kitchen cabinets. Replace hardware for a more streamlined look; paint the front facing of the cabinets to freshen up the room, or remove the doors on the old cabinets and replace them with new cupboard doors. Consider the time you want to put into the project, your budget and your skill level when looking at remodeling options. Get quotes from outside contractors to do the work for you before setting aside your time allotment for the job. It may costs less in the long run to hire a professional. If you enjoy home remodeling, build extra time into your estimate for preparation work, shopping and unforeseen obstacles. Painting is the easiest and least expensive way to update old kitchen cabinets. For the best results, remove the doors and the hardware. Take the cabinet doors down one at a time to lessen the interruptions in your daily routines. Lightly sand the surfaces of the doors to remove any cracking or loose paint and wood. Wash the surfaces completely with soap and water, and leave them out to dry. If the doors are made of laminate, plastic or metal, plan to coat each side with primer before painting. 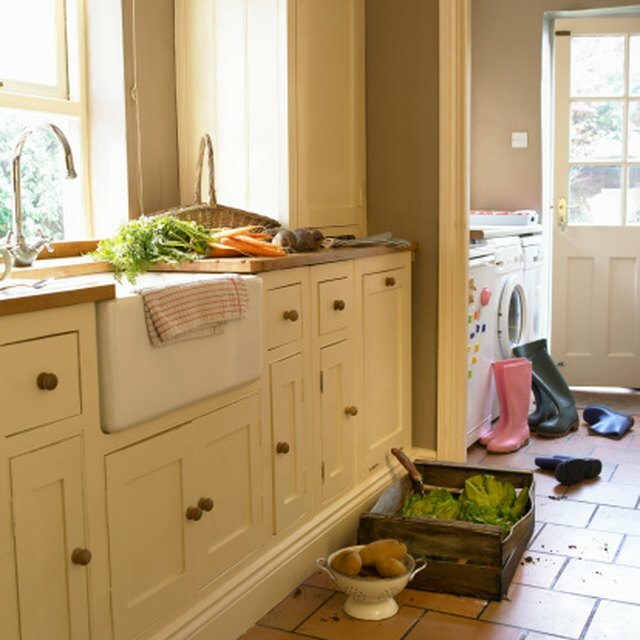 While the door is drying, remove the contents of the cabinets and clean thoroughly. Sand and clean the edges and trim that will be painted. Choose a color that will brighten up the kitchen and match new window treatments or flooring. Allow each coat of paint to dry completely before attaching new hardware and replacing the door. Invest in new custom doors for old kitchen cabinets to give the room a more thorough redesign. Consider replacements if the doors are cracked or broken. Unless you have a fully equipped woodworking shop, you will most likely need to call in specialists for the job. Local kitchen cabinet refacing companies, such as Affordable Kitchens (see Resources below), will come to your home, measure the doors and make recommendations for the replacements. Trim work is usually included in the refacing process. Measure the doors yourself and order new doors online through companies such as Pinnacle Home Products. Check with your local home improvement big box store to see if your cabinet doors are standard sizes. You may be able to purchase ready-made standard doors.